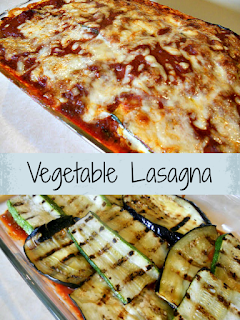 I have made classic style lasagna for a long time, but this grilled vegetable lasagna is a first for me. I've thought about it a lot, but never found a recipe that really made me want to try to make a vegetable lasagna. The kind of vegetable lasagna I always wanted to make is one made with slices of eggplant and zucchini, instead of lasagna noodles, cooked in a tomato sauce. 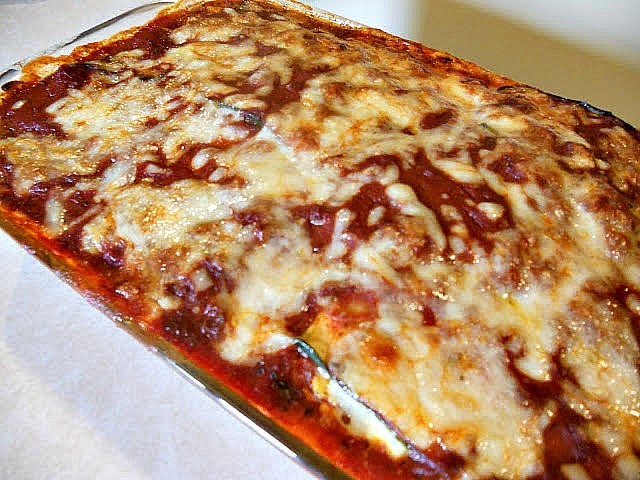 Eggplant and zucchini always seemed to me to be a tasty substitution for traditional lasagna noodles. Well, with eggplant and zucchini in season right now, there really is no better time to try a vegetable lasagna. This post contains affiliate links for your convenience. I will be compensated if you make a purchase with one of these links. Choose zucchini and eggplants that will give you good-sized slices, a minimum of about three inches wide. Sliced about 1/4 inch thick, these strips of eggplant and zucchini will make a good substitution for traditional lasagna noodles. Even though I made this lasagna with vegetables in place of noodles, I decided not to make this a meatless dish. I made the meat sauce I use for my classic lasagna. You can easily make this with a meatless sauce if you choose. You can either us a 13x9-inch glass baking dish or a classic lasagna pan for this lasagna. I used a glass pan because my lasagna pan was in the freezer. The glass baking dish cleaned up like a breeze. Don't you love easy cleanup? Prepare your meat sauce using your favorite recipe, or this one from my classic lasagna recipe. While the meat sauce simmers on the stove, you can prepare your vegetables. Preheat your grill. Slice the zucchini, eggplant, and red pepper. Drizzle with olive oil. Brush or rub the oil over the slices to distribute. Place the vegetables on the grill, cooking for 2-3 minutes on each side. You want the eggplant and zucchini to soften but retain some structure. The red pepper may take longer. You'll want the skin side to blister and blacken. Remove the zucchini and eggplant to a platter to cool. Place the peppers in a glass bowl covered with plastic wrap. This will cause the peppers to steam a bit and make it easy to remove the skin. Wait about 20 minutes or until you can handle the peppers. The skin should peel off easily. Slice each half of pepper into three strips. Mix the ricotta cheese, egg, and parsley in a bowl. Set aside. Shred the 4 ounces of mozzarella and cube the fresh mozzarella. Set aside. Preheat the oven to 350 degrees F. Now you are ready to assemble the lasagna. Place a layer of the meat sauce in the bottom of a 9 X 13-inch glass or ceramic baking dish. Top the sauce with one-third of the slices of zucchini and eggplant, overlapping one with the other. Place half the pepper strips on top of the vegetables. Spoon half of the ricotta mixture evenly on the vegetables. Spread with the back of a spoon or a spatula. Sprinkle half of the fresh mozzarella chunks over the ricotta mixture. Repeat the process again, beginning with the meat sauce. Top this layer with the remaining third of zucchini and eggplant. Pour the remaining sauce over the vegetables and top with the shredded mozzarella cheese. Bake the lasagna for 45-60 minutes, or until bubbly and the cheese has melted. Let the lasagna sit for 20-30 minutes before serving to allow it to set up. The flavors in this vegetable lasagna worked very well together. I know this because I ate one piece...and then another. Yum! This looks so great for someone on a vegetarian diet! While my recipe isn't vegetarian, this lasagna can easily be converted. It would be just as yummy with a spicy marinara sauce instead of a meat sauce. This looks so delicious, I'm going to try it soon. Great pictures too! I bet your kids will even like it, Breeze. The vegetables get disguised a bit in this recipe.